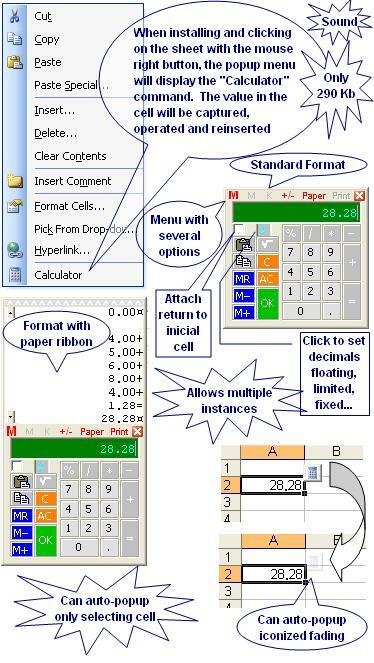 This utility is a COM add-in or add-in (.xla) programmed in Microsoft® Visual Basic® for Application (VBA) that generates a classic popup calculator in Microsoft® Excel® to capture values, operate, and insert results. See the pictures below. It consists of only one file, the ExcelCalculator.dll, which is about 290 kb in size and can be installed automatically using one of the installer package files available below to download. Except for the DLL, no other setting is saved in the Microsoft® Windows® Register. Its setting is saved in ExcelCalculator.ini, ExcelCalculatorHotKey.xla, and ExcelCalculator.xlam files that are created and maintained by the proper utility. You also can uninstall it automatically using the same installer file, leaving no mess on your Windows Register or disc. 3 - Idem to capture and return date to active selection.